It is estimated that about 40 lb (18.2 kg) per year of glue are used for every person in America, and it is easy to see how and why when one looks at the extent of uses. Furniture, plumbing, shoes, books, buildings, and automobiles all use glue in some part of their construction. Glues are part of a larger family called adhesives. The two classes are distinguished by the fact that glue comes from organic compounds while adhesives are chemical-based. Adhering materials called epoxies, caulks, or sealants are also chemical compounds that have special additives to give them properties suitable for particular jobs or applications. Glue came into being when ancient tribes discovered that the bones, hides, skin, sinew, and other connective tissues from animals could be processed to remove collagen, the protein in these tissues. The collagen was sticky and was useful for holding things together. Milk solids, known as casein, and blood albumin can also be used as a basis for glue. Dried serum from cows' blood yields albumin that coagulates (clumps together) when it is heated and becomes insoluble in water. Fish glue was also made from the heads, bones, and skin of fish, but this glue tended to be too thin and less sticky. By experimenting, early man discovered that the air bladders of various fish produced a much more satisfactory glue that was white and tasteless. It eventually was named isinglass or ichthocol. There are three classes of substance that are called glues and that do not contain chemicals, compounds, or high-tech additives; these are bone glue, hide or skin glue, and fish glue. Technically, other sticky substances are adhesives, gums, or cements, although consumers tend to use these terms interchangeably. Plants have also been used to produce glues collectively called vegetable glues. These materials are dispersible or soluble in water and are usually made from the starches that compose many grains and vegetables. The natural gums include agar, from colloids in marine plants, algin that is derived from seaweed, and gum arabic, an extract of the acacia tree (also known as the gum tree). The substance called marine glue is used to caulk seams, but it consists of tar or pitch and is not truly a glue. The earliest evidence of use of glue can still be observed in the cave paintings made by our Neanderthal ancestors in Lascaux, France. These early artists wanted their work to last and mixed glue with the paint they used to help the colors resist the moisture of the cave walls. Egyptian artifacts unearthed in their tombs show many uses of glues; perhaps the most striking are the veneers and inlays in wood furniture, which was made using glue as early as 3,000 B.C. The Egyptians also used glue to produce papyrus. Greek and Roman artists used glues extensively; mosaic floors and tiled walls and baths are still intact after thousands of years. In the 1930s, advances in the chemical and plastics industries led to development of a wide range of materials called adhesives and plastic or synthetic resin glues. World War II led to a further flowering of this industry when neoprenes, epoxies, and acrylonitriles were invented. These were used by the military and were not available for commercial use until the late 1940s or 1950s. Since that time, highly specialized, waterproof adhesives have been developed for many industries and unique applications including construction of the Space Shuttle. Glues are still used in woodworking and the manufacture of abrasives like sandpaper. They are also used as a colloid in industrial processes; colloids are added to liquids to cause solid particles that are suspended in the liquid to separate out so they can be recovered, either to clean the liquid or process the solids. Best remembered as a philanthropist, Peter Cooper was a prolific inventive genius and a highly successful manufacturer. Cooper was born in New York City, the son a Revolutionary army soldier who was active in numerous enterprises and involved young Peter in all of them. Although Cooper had only one year of formal education, his early experiences with his father prepared him for success in his varied business career. Apprenticed to a coachmaker at the age of 17, Cooper did so well that his employer paid him a salary and offered to back him in his own enterprise. Instead, Cooper went into the cloth-shearing business, in which he prospered. He then bought the rights to a glue-making process, improved it with his own invention, began operating a glue factory, and secured a virtual monopoly of the American glue business. In 1828 Cooper moved into iron manufacturing, building the Canton Iron Works in Baltimore, Maryland, intending to supply the Baltimore & Ohio Railroad. The railroad was on the verge of failure, however, because of the twisting and hilly route its tracks followed. Most engineers at that time held that locomotives couldn't run on such terrain. Cooper promptly built America's first steam locomotive, which was small but powerful. In 1830, this "Tom Thumb" pulled 40 passengers at a speed of 10 miles per hour and proved that railroads could run on track that curved. Cooper's business enterprises grew rapidly after this success. His iron business expanded into mines, foundries, wire manufactories, and rolling mills. In 1854, Cooper's Trenton factory produced the first iron structural beams for use in erecting fireproof buildings. 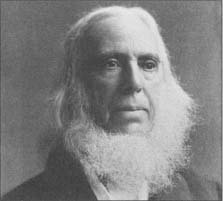 Cooper became a principal backer and unwavering supporter of Cyrus Field's (1819-1892) project for laying the Atlantic telegraph cable. As president of the North American Telegraph Company, Cooper owned and controlled half of the telegraph lines in the United States. As an inventor, Cooper designed an early washing machine and various engines for powering watercraft. Glue manufacturers obtain bones and tissues of animals from slaughterhouses, tanneries, and meat packing companies; it is no coincidence that the world's largest glue manufacturer is the dairy called Borden Company. The animal remains that are the raw materials for glue may include ears, tails, scraps of hide or skin, scrapings from the fleshy sides of hides, tendons, bones, and feet. Similarly, manufacturers of fish glue obtain bones, heads, scales, and skins of fish from canneries and other processing plants. With only minor variations, the same basic processes are used to make bone glue, hide or skin glue, and fish glue. The hides and other scraps are washed so that dirt is removed, and they are soaked to soften them. This material is called stock, and it is passed through a series of water baths in which more and more lime is added to make the hides and skins swell and break them down. The swollen hides are rinsed in a large washing machine to remove the lime. The last traces of lime are eliminated by treating the stock with weak acids like acetic or hydrochloric acid. Finally, the stock is cooked either by boiling, it in open tanks or cooking it under pressure in autoclaves. Cooking at the correct temperature and for the right length of time breaks down the collagen and converts it into glue. If the temperature or timing is off, the quality of the glue will be ruined. Large steam coils in the open tanks heat the water and product to 160°F (70°C). Three or four treatments with clean water are performed at increasing temperatures (or pressures if a pressurized system is used). The resulting liquid, called "glue liquor" is extracted and reheated again to thicken the glue. When cooled, this material looks like jelly and is solid; although it looks like the kind of gelatin used in food, it contains impurities. To remove the impurities and make the glue clear, chemicals like alum or acid followed by egg albumin may be added. These chemicals cause the impurities to precipitate, or fall out, of the glue. Mechanical methods can also be used to clean the glue. These include passing the glue through a series of mechanical filters or through paper filters or ground bone called bone char. Different additives are mixed with the glue liquor to make brown, clear, or white glue. Sulfurous acid, phosphoric acid, or alum are among these additives. Zinc oxide is added to produce white "school glue." To this point, the glue is a weak, runny liquid. It is made more concentrated in vacuum evaporators and dried in one of several methods. The glue can be chilled into either sheets or blocks then suspended on nets to dry and become still more concentrated. The glue can also be dropped as beads or "pearls" into a non-water bearing liquor that further dries the concentrated beads. The pearls, blocks, or sheets are then mixed to the right consistency and pumped into bottles or jars for sale. Manufacture of bone glue is somewhat more complicated. Bones are processed most often in pressure tanks, but additional processing is needed to remove the minerals. The bones are degreased with solvents, then hydrochloric acid in an 8% solution is applied to the bones. The acid removes calcium phosphate and other minerals and leaves collagen in the same shape as the piece of bone. The acid is removed from the collagen, and it is dried to produce commercial-grade ossein or bone protein (also termed acidulated bone) that is the basis for bone glues. 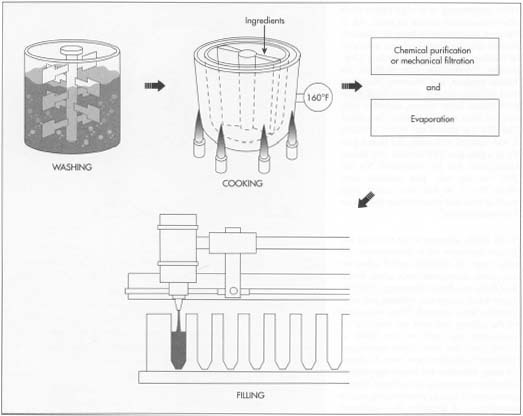 After the ossein is created, it can then be processed in the open-tank method and the subsequent steps used to make glue from hides, as described above. All processes in the manufacture of glue are monitored carefully using instruments, computerized controls, and observation. Improper temperatures or pressures will ruin large quantities of stock that must then be wasted; manufacturers will not risk such errors. Safety and sanitation are also major concerns. Glue manufacturers tend to be located very close to supplies of hides and other raw materials to prevent disease, vermin, contamination, and major costs like transportation. Workers' safety is carefully monitored, as is the production of a pure glue. Glue itself is a byproduct of dairies, meat processing plants, and other facilities that generate the raw materials needed for glue production. Glues are essential to our future. More and more manufacturing processes are using various forms of glue (and including adhesives) to replace stitching, stapling, and more expensive (and less effective) forms of fastening. Experiments with medical glues suggest that one-third of all wounds may be "stitched" with glues in the next few years. Glues have proven to be so versatile that scientists are constantly watching for new applications that will make our lives simpler. Giles, Carl and Barbara. Glue It! Blue Ridge Summit, PA: TAB Books Inc., 1984. Miller, Robert S. Adhesives and Glues: how to choose and use them. Columbus, OH: Franklin Chemical Industries, 1980. Allen, Laura. "Sticky stitches." Science World (October 6, 1997): 6. "Sticky stuff." Science Weekly (January 10, 1996): 1. Advanced Adhesive Technology, Inc. http://aatglue.com/ . American Chemical, Inc. http://www.glueit.com/ . The Gorilla Group. http://www.gorillaglue.com/ . What is the source for the estimate of how much glue is used per person in America? Thanks. Hello! I was wondering if you could tell me what kind of glue is used for sticking he paper onto a water bottle (its for a school project) whether it is bone glue, hide glue or perhaps skin glue. Thanks so much. Is it possible if the water in the rice cooker boils can be made into a glue!? please give me an idea on how to make this work!!!! this is my investigatory project!!! how about pitch glue? who invented that ? why it requires charcoal ? Are there any other chemical raw materials that can be mixed to prduce glue other than hides,fish remains,bones,e.t.c? Do you know what is the energy consumption in polyvinyl glue manufacturing process? how is the chemical manufacturing formulation arranged.what is the order?